Hickman teacher chosen for elite national climate change workshop. '60 Kewpie, Leighton McCormick's new book, "House On October Hill" actual locales are based on Columbia area. Support Hickman Athletic Booster Club - Get your personal "Forever Kewpie Stone"
Scholarships need your help so the annual gift can be increased to $1,500.00 each for the "kewpie.net Scholarship"
and $750.00 each for the "Charley Blackmore's Class of '63 Scholarship"! Both scholarships need another 7 or 8 K, to put them at the next level! Thanks!!!!! Class of '56 Kewpies 60th Reunion was July 15-17, 2016.... They're the Seniors of HHS! How helpful the CPS was with our schoarlships? Hickman PTSA needs our help, students need a portable stage. Thanks for your consideration. Presidential Scholars - Happy 100th BDay to our KEWPIE - Hall Of Leaders - Share your comments! Class of 1943, had the 1st 70th Reunion in the history of Hickman High School - Video - "Class of '63"
Kudos to Ashwath Kumar, 2014 Kewpie, wins American Legion's national speech contest! Two Kewpies of the Class of 1941 celebrate their 70th Wedding Anniversary! "Recent Inductees to The Columbia Golf Hall of Fame"
Daniel Dreifuss, '96 Kewpie, foreign exchange student returns to Columbia annually. Congrats, J'den; Hickman's Cox becomes the 1st Columbia wrestler to capture 4 state crowns! 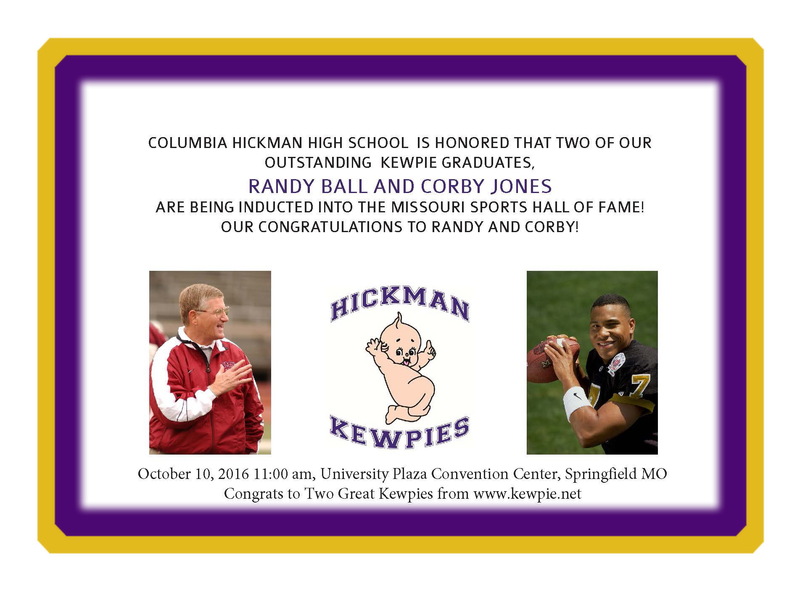 Congrats to Marina Steinhauer, Thomas Nabelek & Claudia Sipakati, Michael Logan & Karley Mirts and all 2012 Kewpies! The Naked Baby Rules, Kewpies, They Are Everywhere! - "Send your pic New or Old"
Do you know the real story of how the "Kewpie" bcame the mascot? Copyright © 1998 - 2015 - Kewpie Classmates. All Rights Reserved.